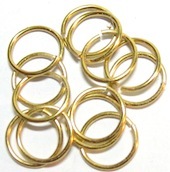 Use a jeweler's saw to cut wire coils into chain maille jump rings. If a power saw cutting tool isn't available good results can achieved by using a jeweler's saw. Smooth even precise cuts can be made which will allow the jump rings to be opened and closed correctly. Two of the methods that can be used are the wrapped coil approach and the use of a wooden dowel inside the wire coil. 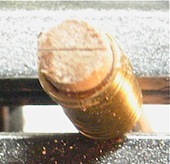 These techniques require a jeweler's saw, masking tape, wooden dowel and a small vice. Step 1: Firstly wrap your wire around a mandrel and make your coil. Short coils are best for this method. You can make a long coil and then cut it into short sections if you like. 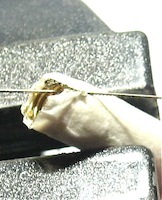 Step 2: Take the coil and wrap it in 2 or 3 layers of masking tape so that it is fully covered. Step 3: Place the coil in a vise so that it is angled downwards. Do not over tighten. 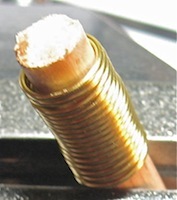 Hold your blade on an angle and begin to cut the coil as per the photo. Cut slowly, you may need to support the bottom of the coil with your free hand. Do not place too much pressure on the blade whilst cutting. As you cut, continue to check to ensure that your cut is straight. Step 4: Carefully unwrap the rings and you should have some neatly cut chain maille rings. The saw cut should be smooth and even with all the rings the same size. 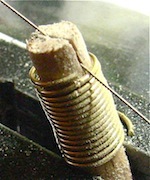 Step 1: Either use a wooden dowel to wrap your coil or slide the coil over a dowel after you have wound it. A snug fit is best as this will stop the coil moving around too much as it is being cut. Hold the dowel firmly in the vice. Step 2: Cut straight across the dowel with your blade, this is the guide slot for the blade. Step 4: Place the dowel on an angle and put the blade into the slit on top of the dowel. Tilt the saw handle downwards and begin to slowly cut through the dowel and then into the rings. 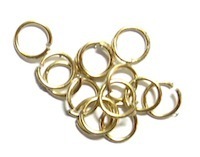 Step 5: After you have finished the cut you should have nicely formed jump rings for use in your chain maille jewelry.